Greenskis philosophy is 'Think green, Eat green'. Consuming locally grown and organic produce where possible and living a clean, healthy sustainable life. Delicious and nutritious recipes, tips, tools and stories to 'Think green, Eat green' and achieve a healthier, happier and greener life. It is madly snowing in Vancouver today. It is unusual that it snows in the city, only the mountains receive favourable dumps at this time of year. It has not stopped all night and all morning and I guess my son and I will be layering up to enjoy some snow fun making snowballs and snow angels later this afternoon. Right now I am craving comfort, snuggling up on the sofa with a warm slice of banana bread and a cup of tea while I watch the beautiful snowflakes fall. My favourite banana bread is one that has a generous quantity of banana in it, soft without crumbling (but not wet), and a nice crust on the outside. There are literally hundred’s of banana recipes out there, and there is always an ingredient or two I don’t like in each recipe so I’ve created by own. When the cold is just too much you can give it a summery feel with coconut and berries. It was a baking morning today. As much as it is beautiful to look out at all the snow-capped rooftops and trees, it is not at all inviting to step outside and my son was starting to get restless for some activity so he helped me. He had lots of measuring to do with all the dry ingredients and mixing all the wet ones in the well. This kept him happily busy for about half an hour, which is fabulous when you are a parent running out of things to do indoors… however as a precaution you need to know there will be lots of mess! He was particularly delighted to see the final product and give it the first taste test. 1. Preheat oven to 300 F or 150 C. Grease a 7cm-deep 100mm x 200mm (base measurement) loaf pan with oil or melted butter. Line the base and sides with non-stick baking paper. 2. Sift the combined flours and baking powder into a large mixing bowl. Add the sugar, coconut and cinnamon and mix through so ingredients are evenly distributed. 3. Make a well in the centre. Add the eggs, banana, oil and vanilla and again mix well. Fold through the frozen raspberries. 4. Pour into the prepared pan. Smooth the surface. Bake for 1 hour and increase temperature to 355 F / 180 C for a further 20 minutes or until a skewer inserted comes out clean. Set aside in the pan for 15 minutes to cool before lifting out onto a wire rack to cool completely. Note: It is quite a dense mixture so I like to bake it slower and longer to deliver a great result. Other combinations I have tried are gluten-free four, banana, blackberries and chocolate and also banana, raspberries and date. They all seem to taste good to me. Ok… over to my again husband to recount our recent trip. old fashion road trip. I think Canadians and Aussies definitely share a common enthusiasm for long, meandering drives to wonderful destinations. Our countries are decorated with natural beauty but in both cases it can take a mighty long time to get there. You can lament this situation or just strap yourself into a trusty vehicle, turn up the stereo and enjoy the ride. Equally, what better way to see a new country than from the vantage of a road trip and what better time of the year to do it in, than Fall. The Okanagan Wine Country is about 5-6 hours north east of Vancouver and the Zielinski’s opted for a timeless classic in the form of a Volkswagen Westfalia. This van rolled off the production line in 1986, so it was a vintage VW but had been lovingly maintained all those years so was still highly reliable (we hoped…) It came with it’s own fridge, cooktop, double bed and a top speed, on the downhill, of 110km/h. Having this chariot chug us down the highway added a deft touch of romanticism to our trip. The drive up was beautiful and even swept us pass Hope, BC the setting for the legendary Sylvester Stallone film “Rambo, First Blood”. We took a pre-planned pit stop at a roadside fruit and veg store to feed one of our touring party’s growing addiction for pumpkin and gourds. These were critical components to the upcoming Halloween festival. We spied a slinking wolf on the way up and arrived in Naramata in the early evening. Here we met the lovely and gregarious Renee who ran a delightfully unique B&B – Robinson Bed and Beach. Her links to the area were indisputable as her grandfather was one of the first to settle in the area and built the Heritage Inn. The B&B had a moose head proudly on display that apparently fed Renee’s relatives for two years during one particular lean period. It’s difficult to describe the B&B in words other than to say eclectic would be high on the list. It was perfectly placed on the shores of Lake Skaha, so the sunrises were breathtaking. The view was enhanced further by the jumping into the outdoor Jacuzzi with a coffee or wine depending on the time of day. Now, back to the main purpose of our trip – wine tasting. Obviously everyone was looking forward to this, especially our hosts who were itching to introduce us to some fine wineries. The only tragedy we struck was my wife learning 3 days before we left that she was 5 weeks pregnant with our second child. Devastation at not wanting to drink wine due to the incessant nausea countered by joy of knowing we were growing a second child would describe her mental state. So I took it graciously upon myself to taste and drink for the two of us. Almost all of us thought this was very selfless of me. All 3 days of our Okanagan visit involved a very similar routine. We set out mid morning after a quick Jacuzzi by the Lake, carefully keeping an eye out for the legendary Okopogo. 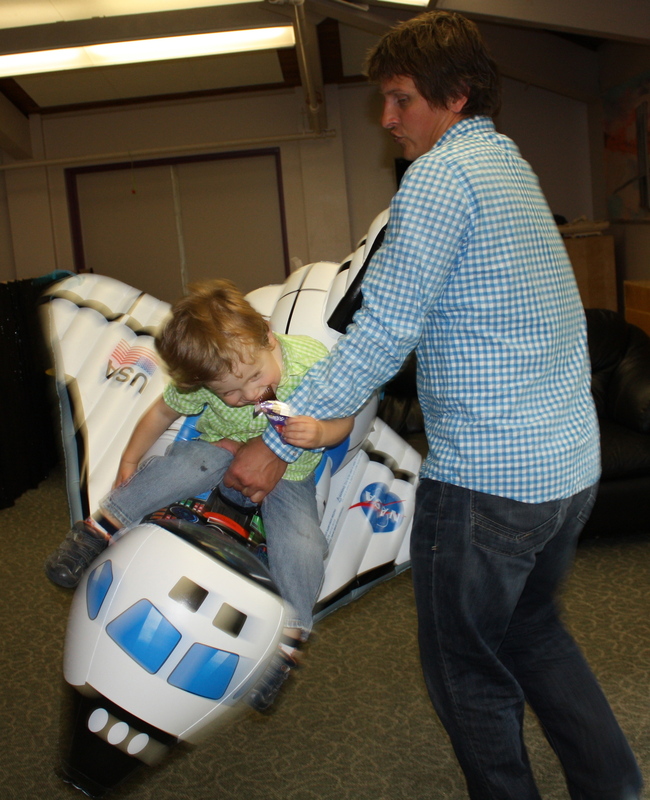 We would then hit a few wineries before lunch and before our kids self destructed. Then we would visit a few more vineyards in the afternoon (mainly G and I) whilst the ladies would corral the kids back to the B&B for some entertainment. Perhaps the greatest challenge during the weekend was entertaining the 3 kids whilst we tasted. My memory of all the wines we tasted and vineyards we visited is limited but my general impressions were that the region is truly breathtaking. It rivals and tops many of the wine areas I have been lucky to visit so far. I would rank it above the Hunter Valley, Clare Valley, Napa and it would be on par with the Dordogne, France. Whilst in terms of its wines this region is an infant in comparison since most vineyards are 20 years or less old. There were definitely many standouts however, they are probably a little over priced and I was a little frustrated by the tasting fees which appeared almost mandatory at every place, even the small vineyards. I know this is standard practice in the States but it doesn’t sit very well with me as tasting the product is part of doing business. Anyhow this aspect didn’t detract greatly from our experience. We even visited a wonderful cheese farm, a vineyard, Elephant Island, that made wines from plums, raspberries, blackberries, apples and peaches. This probably harks from the time that the Okanagan was overrun with plenty of orchards. Some 15 years ago there was a shift from orchards to vineyards as everyone eyed the potential for more money from selling bottles of wines rather than boxes of apples. I am sure glad they did as the region is spectacular. OK, so what wines stood out I hear you plead. Definite highlights included the Burrowing Owl in Oliver, Quail’s Gate in Kelowna and in Narramatta I loved La Frenz, Red Rooster, Wan Westen and Poplar Grove. The most epic and Napa like vineyard was undoubtedly Mission Hill in Kelowna. This is a monument to largeness. Epic! Mammoth! Gargantuan! All these descriptors aptly provide a snapshot to this place. It is framed with massive marble and stone arches, roman-like pillars and amphitheatres which funnily enough provided the kids with so much fun as they rolled down them a million times. This was where our trip concluded. We sadly filed back into the Westfalia and braced ourselves for the long car trip home. We three were happier for the amazing landscapes, food, wine and friends we enjoyed for Thanksgiving 2012. I feel a little disappointed in myself for not having posted anything since early October. Well I have a really good reason for that now! I felt a little out of sorts a few days before I stopped writing, and lost my way with inspiration, cooking and the adventures we were getting up to. The only time I remember having a lack of interest in food and cooking was when I was pregnant back in 2009. So there you are…I found out just before Thanksgiving weekend that I was pregnant again! Anyway, to get me going again I thought I would post this recipe now for our friends Nicola and Steve who we enjoyed it with this weekend. I reserve this recipe for entertaining, because once you find out how good it tastes, you will find it hard to stop at one piece! Beets have been marching into the stores in droves. 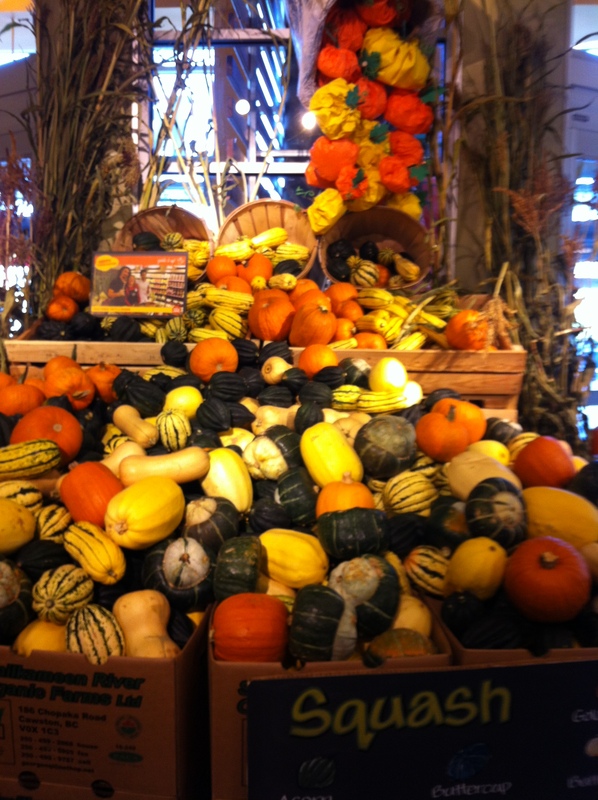 They are well and truly a favourite fall produce pick of mine. Leading into winter, they are a vegetable loaded with cold fighting properties; and honestly I think they taste good in just about anything; juices, in burgers (it’s an Aussie thing), baked with your favourite roast beef dish, relish, warm winter salads and this tart recipe by Valli Little which was published in the March issue of delicious. magazine, 2011. This tart is delectable and although you may think by looking at it that there could be a degree of difficulty because of how amazing it looks, there isn’t! Just follow the recipe and you will be rewarded with this beautiful dish which I would not change in anyway…it’s almost perfect! I have tested it out on guests and we all politely held back from being the first to dive in for another serving. If you are fortunate enough to still have some left, it will just last till the next day – it is best served on day of cooking. 1. Place beetroot in a pan of cold water and bring to the boil. Reduce heat to medium-low and simmer for 1 hour, topping with water if necessary, until tender. Drain. Refresh under cold water and leave to cool. Peel and coarsely grate. Set aside. 2. Meanwhile, for the pastry, place flour, butter, thyme and a pinch of salt in a food processor and whiz until the mixture resembles breadcrumbs. Add 1/4 cup (60ml) chilled water, then process until the mixture comes together in a ball. Enclose in plastic wrap and chill for 30 minutes. Lightly grease a 30 cm loose-bottomed tart pan. On a lightly floured surface, roll out pastry to 5mm thick, then use to line the tart pan. Chill for 15 minutes. 3. Preheat oven to 180 C / 355 F. Line pastry with baking paper and fill with pastry weights or uncooked rice. Bake for 10 minutes, remove the paper and the weights, then bake for 5 minutes or until dry and pale golden. 4. Heat the butter and oil in a frypan over medium heat. Add onions and 1 teaspoon salt, then cook, stirring occasionally, for 6-8 minutes until softened. Add beetroot, vinegar, thyme and sugar, then cook, stirring for 5 minutes or until thickened and syrupy. 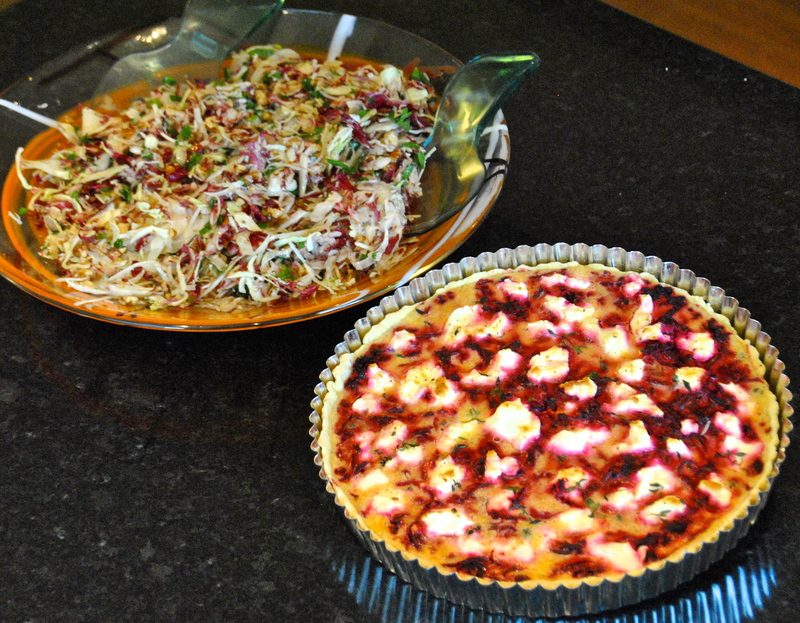 Spread beetroot mixture over the tart base, then crumble over the cheese. 5. Whisk egg, cream and nutmeg together, then pour into the tart case. Scatter with extra thyme. Bake 35 minutes or until set. 6. Meanwhile, combine the creme fraiche, horseradish, Dijon and lemon juice, then season. Keep chilled until ready to serve. 7. Cut tart into slices and serve warm or cold with horseradish cream. I like serving this tart with a fennel salad on the side. Enjoy! 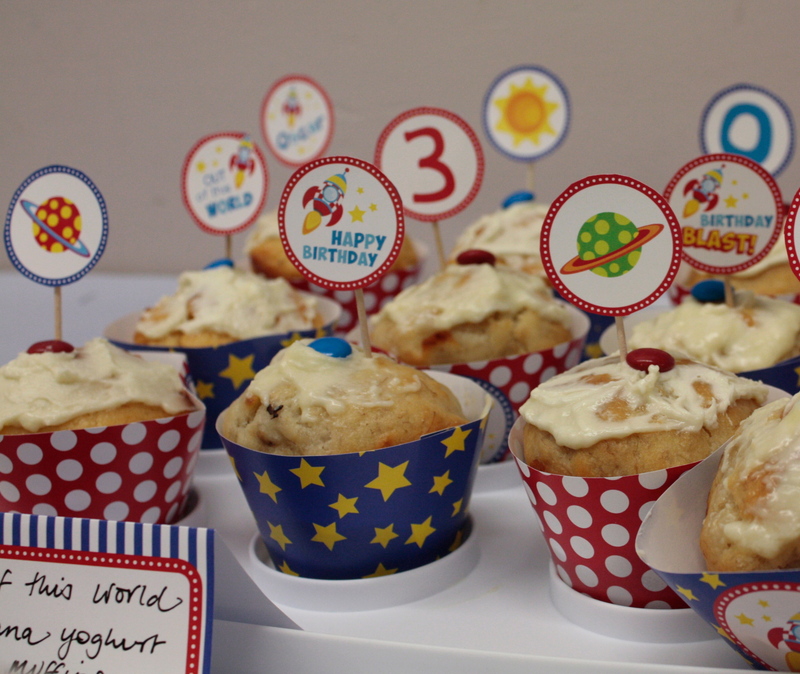 I love birthday parties, in fact I love all parties!! I really enjoy the planning part and creating the vision and theme for a party…and then there’s the doing, which I don’t love as much. Just as well I have a very involved husband who enjoys putting my ‘creative visions’ into action! 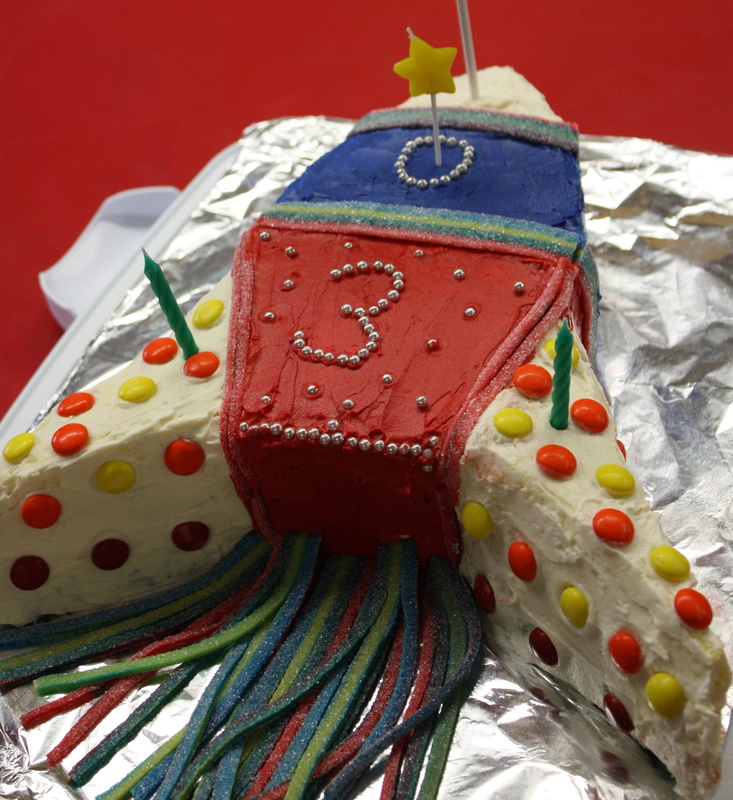 For our son’s recent 3rd birthday party, he said he wanted a rocket cake. I must say I was happy and relieved three weeks leading up to the big day he had changed his mind from what he previously requested which was a Lightening McQueen cake! This would have caused way more stress to build a car than a rocket (in my mind) so I worked at building enthusiasm and excitement over a rocketing good party theme. I searched for ideas and inspiration around the theme…as you do, and finally sourced what my cake base was going to be and the type of rocket ship cake I wanted. I have used a combination of recipes to achieve what I wanted, because that’s what I do to perhaps make things a little more complicated! This is the type of cake you can definitely take breaks with in-between to entertain child, make coffee, clean up toilet training accidents etc, because it is virtually impossible with child to do it all in one go! Anyway, here is the white cake base mixture recipe I used and slightly adapted which I found on the Whisk-Kid.com for her super epic rainbow cake. 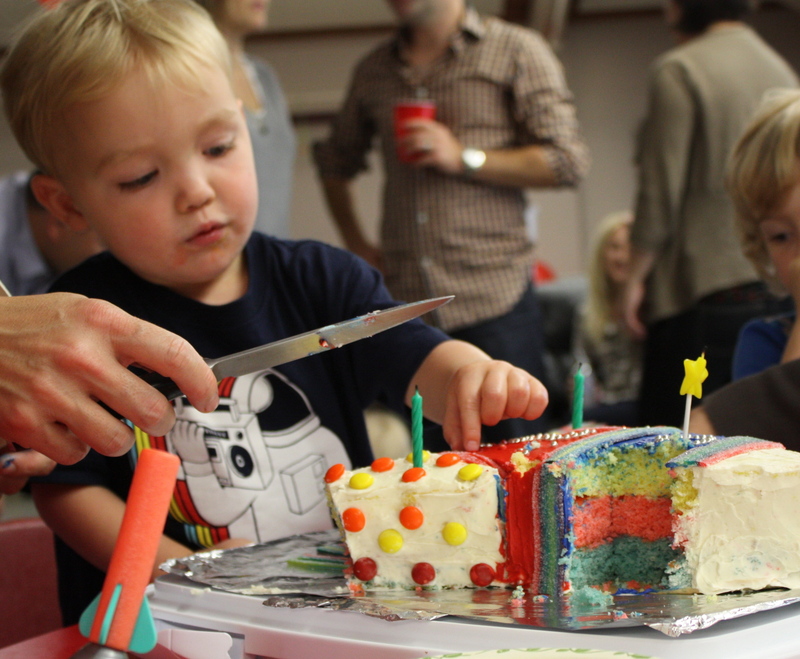 I wanted to create three coloured layers inside the rocket cake to reflect the colours of the icing on the outside. The colours I used in my layered cake were blue, red and yellow. I wanted to use as much natural colouring as I could in the cake, so the layers were given natural flavours of blackberry, strawberry and lemon. The cake design for the rocket was sourced from http://www.taste.com.au and called a Flying rocket cake which provided the template. I used a standard buttercream icing for the outside of the cake. White Cake – please note, this mixture is enough to make three thin cakes in a 23 cm x 23 cm sized cake tin. 1. Remove ingredients; eggs, butter and milk out of the fridge to let them warm to room temperature. Meanwhile thrown in a handful of washed strawberries into the blender and then strain through sieve to catch the juice. Set bowl aside. Do the same with blackberries and set aside in another bowl. Using a micro-plane grater, shave lemon zest from a lemon and also set aside. 2. Preheat the oven to 180 C / 355 F degrees. Oil and line three 23 cm x 23 cm square cake pans or two and reuse one for the third amount of cake mixture. 3. Sift together the flour, baking powder and salt. Set aside. 4. Cream the sugar and butter, then add the egg whites (I cracked them all into one bowl) and add them a little at a time. Add the vanilla and mix until fully incorporated. Then alternating between wet and dry, add the milk and flour in two parts. Ensure you stop mixer when adding these otherwise there will be milk and flour everywhere! 5. Divide the batter amongst three bowls. The best way of doing this is to weigh your mixing bowl before you have added any ingredients and then subtract the weight of the bowl from the final measurement after the batter is completed. Divide that number by three and add that weight of batter to each bowl. 6. Add one tablespoon of strawberry juice to bowl number 1, one tablespoon blackberry juice to bowl number 2 and the lemon zest to bowl number 3. I whisked in a small amount of GEL food colouring into each to achieve a greater depth of colour, but not much as I didn’t want them to be really bright. The colour of the unbaked batter will be the colour of the baked batter. Pour into the pans and bake for 15-20 minutes each or until a skewer just about comes out clean (they will cook a little further in the pans while resting). 7. When you remove from the oven, let them rest on the cooling rack for 20 minutes, in the pan. They may be a little sticky, so flip carefully onto a plate lined with baking paper and cover placing into the fridge to cool quickly for 30 minutes. 1. Ensure you have a cake board or plate that measures at least 34cm in width and 40cm in length. I covered mine with foil to give it the space look. Remove cakes from the fridge and place the blue one on a flat board (like a plastic chopping board) still with the baking paper underneath this base one, layer the red cake on top and then the yellow and ensure it is lined up as well as possible. Please note the cakes should have a slight sticky texture to them so they should hold well together, however if corner parts need a little extra sticking, use a small amount of strawberry jam or sugar syrup. 2. I measured each side to check that the three layers were even all around. However should your cake be a little sloped, shave off a tiny bit slowly, slowly with a serrated knife to even up. If you are careful spreading batter mixture into the pans they should be very flat and level. 2. With pre-printed template of rocket cake, place over the top of the cake and pin with toothpicks to secure at sides and tip and very slowly, cut the shapes with a serrated knife. I cannot stress enough it is important to move very slowly! I used a steak knife as it is smaller than a bread knife. 3. Place the cut fins of the rocket cake in their correct place, securing if you need to with sugar syrup. Note:- At the end of assembly, slip the baking paper out of the bottom base cake carefully (with a pair of extra hands) and spatula if you need it as it can be a little sticky. Red and blue GEL food coloring. 1. Place the butter in the bowl of an electric mixer and beat for 6-8 minutes or until pale and creamy. Add the icing sugar and vanilla and beat for a further 10-15 minutes or until light and fluffy. 2. Using a cake spatula, spread the icing over the cake first to do a crumb coat, sealing any edges and joins and then place in the freezer for 20 minutes. 3. Remove cake from freezer. Split icing into three bowls. Add a few drops of blue to one, a few drops of red to another and mix well. The other bowl will remain plain coloured. 4. I started with the red area first, then the blue and then used the spatula to add more plain icing to the white areas and smoothed them out. 5. Finally, the decorations! Cut sour straps to size to neatly separate coloured areas. Place silver cachous and M & M’s all over and then remaining sour straps (which I used a knife to separate strap colours) as the rocket ship blasting fire out the back. 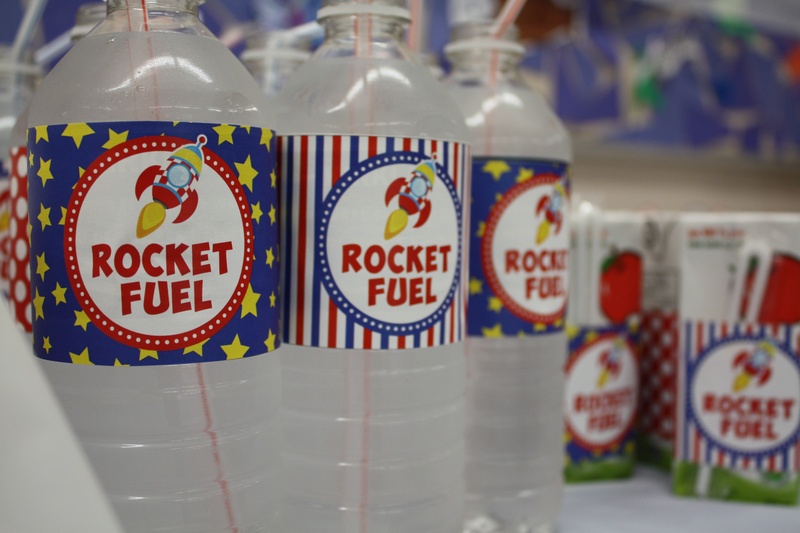 To follow in theme, the menu of food included; rocket dogs, cornflake meteorites, starry trail mix (selection of moon chocolate rockets, dried fruit selections in different containers), out of this world banana yoghurt muffins and rocket fuel drinks. 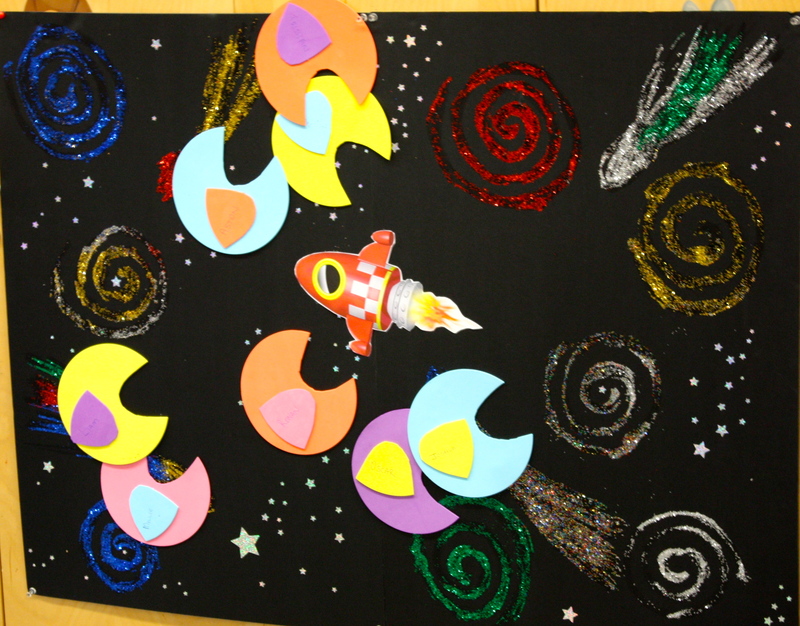 With rocket ship and space games like; find the meteorites, pin the planet on the rocket ship, catch the asteroids and pass the light sabre kids were well and truly entertained for a couple of hours! It was fun, but I am glad birthdays only come once a year! Halloween is approaching, and we Aussies are newcomers to the traditions and parties that take place here in Vancouver on October 31. We just don’t celebrate it in a big way like it is in Canada and the US so it’s sure to be an eye opener. The stores are in preparation stocking the shelves with decorative ornaments, costumes and loads and loads of candy! What I’ve never seen back home is all of these treats are manufactured and packaged into a special Halloween size (mini snack size)…it’s full-on, seriously on another level! Supermarkets are exploding with pumpkins, everywhere you turn there are bulbous orange objects of all shapes and sizes staring at you in the face. I look forward to dressing up, I look forward to seeing my son ‘trick or treat’ and most of all participating in making or baking some Halloween goodies. 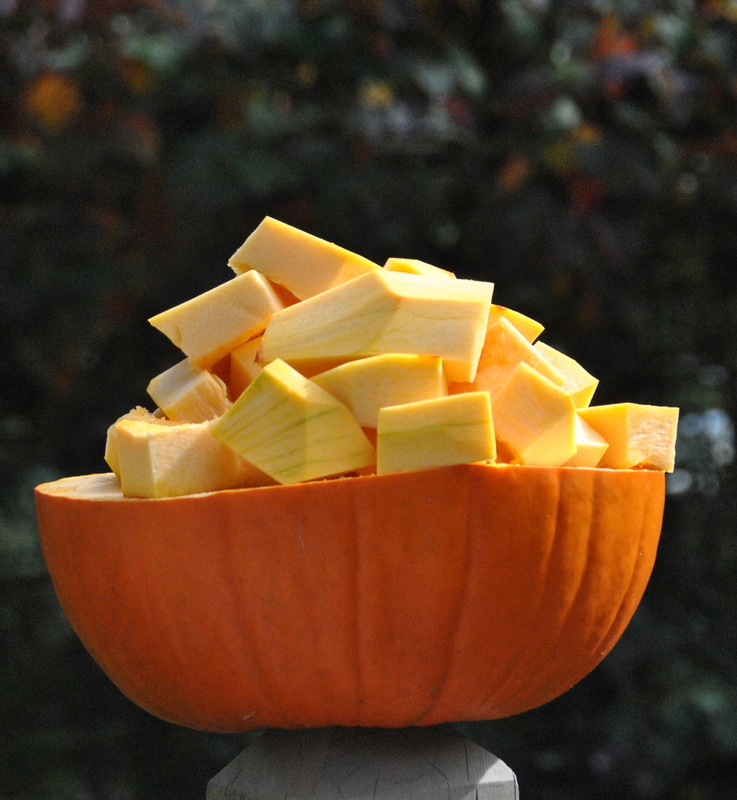 But one thing I do have experience with is eating pumpkin. I am used to cooking it in roast dinners; ‘Roast lamb with pumpkin and potato with gravy’ is a Sunday favourite back home and in wintertime many weeks may include pumpkin in risotto, soups, curries and stir-fries. Perhaps one of the most popular dishes that presents pumpkin a good light in the fall here in Canada is pumpkin pie around Thanksgiving which I haven’t mastered yet! It’s loaded with anti-oxidants; vitamins A, C and E as well as B complex group vitamins. What’s more is that the seeds which you can roast are an excellent source of fibre and minerals like iron, selenium and zinc. It’s a fairly sustainable food too with the flesh, seeds and sometimes skin all being used and eaten in recipes. So for now, here is a warming recipe which was published in the July, 2005 issue of delicious. magazine (Aust. edition) adapted ever so slightly to my taste. Optional: Thinly sliced red onion and red chilli, to garnish. Note: I used ground baked pumpkin seeds prepared while soup was cooking. 1. To make the coriander pesto, process coriander, lemon zest, lemon juice and garlic in food processor. Slowly add 3 tablespoons of the oil to give a sauce consistency adding a little warm water if necessary. Add walnuts and process again and then season. 2. Heat the remaining tablespoon of oil in a large pan over a medium heat. Add onion and cumin stirring for 1 minute. Add ginger and red curry paste and stir for one minute. 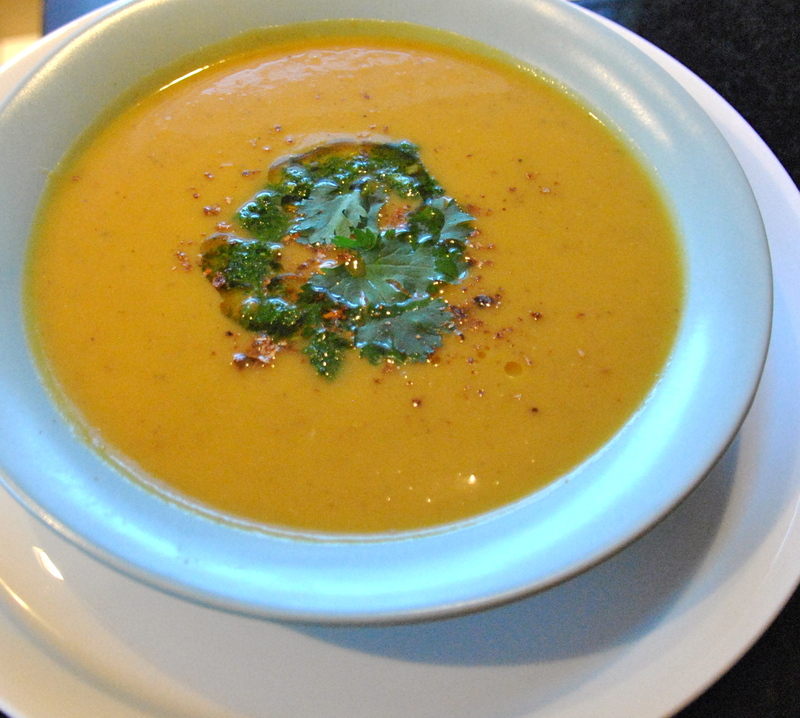 Add pumpkin and stock, bring to the boil, then simmer over a low heat for 15 minutes until pumpkin is cooked. Cool slightly and then blend until smooth. Return to the pan, add the coconut milk and season and warm through. 3. To serve, place in soup bowls and swirl in a spoonful of pesto. Garnish with the ground roasted pumpkin seeds, reserved cilantro/coriander leaves and drizzle a little extra virgin olive oil. 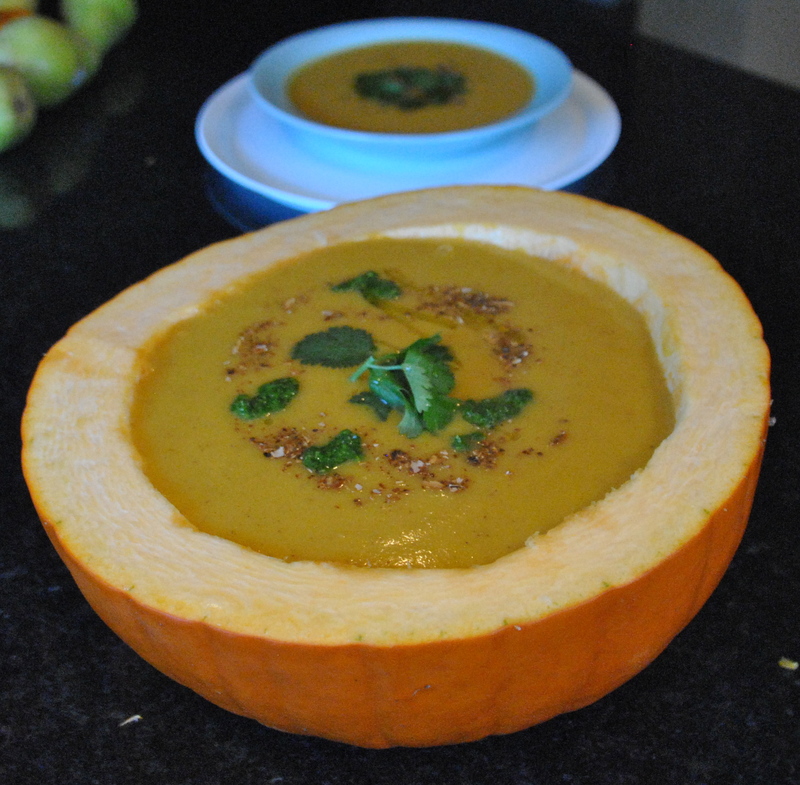 Note: For a party, and a bit of a retro look you could serve soup in the pumpkin as shown. With my limited knowledge and experience at blogging, I have only just discovered that 30 countries in total have viewed my blog!…now this is more countries than I have ever travelled in my entire life and some I know very little about when it comes to the food and their food culture, for example Iceland. So, I am setting myself a challenge to publish one recipe from each country, even if I’ve never cooked them before! Some might even be a favourite dish that I have treasured over the years…who knows what I’ll discover. It could take me a year or so and it will be a great learning experience. Whenever I post up a recipe from one of these countries, the subject header will include both the recipe and the ‘world food challenge’ in it so you know its part of this series. I cannot guarantee the authenticity of each recipe as I cannot speak the languages of the countries but I will attempt to do them as much justice and respect as they deserve. I will always credit and source a recipe too. Thank you, to all of you that have stopped by my blog around the world – much appreciated. If you are reading this and you would like to share a particular dish or favourite from your country, I’d love to hear from you. Here’s to the beginning of my world challenge culinary adventure – Enjoy!